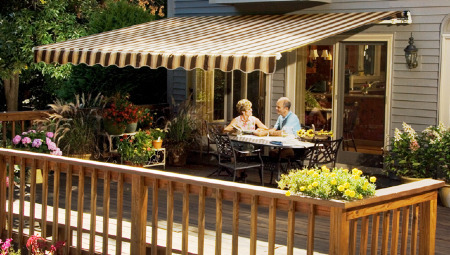 SunSetter offers a beautiful retractable awning for every budget and need – SunSetter Pro, SunSetter Motorized and SunSetter Vista! Weather Breaker Panel included, Remote Control, Powered by a hidden Somfy motor. No other motorized brand can surpass its affordable combination of craftsmanship, eye appeal, reliability, simplicity, and safe, easy operation. An exceptional value. Powered by a hidden Somfy Motor – the finest in the industry. Also available with an optional Remote Control. 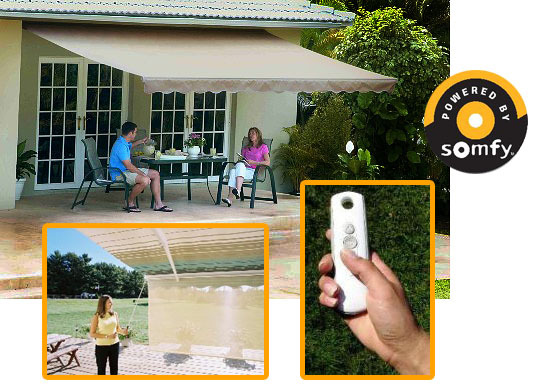 The whole point of an awing is coverage – protection for the sun's rays or from light rain showers. No other model gives you more coverage that the Motorize XL and the Motorize Pro XL! Enjoy and extra 1.5 ft of projection, maximizing your usable space to it's fullest. 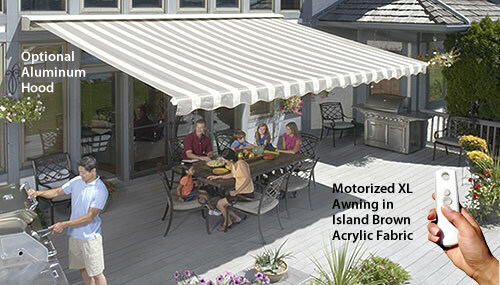 The same good looks, quality construction and color choices as our motorized models, the non-motorized VISTA awning opens with the enclosed hand crank.